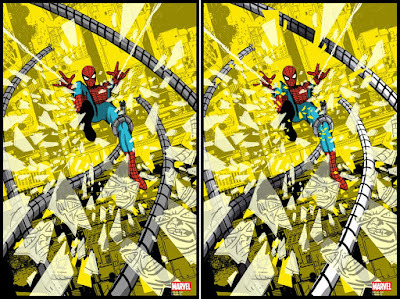 Grey Matter Art and Raid71 (aka Chris Thornley) continue their fantastic, officially licensed Marvel Comics screen print series “Spider-Man Vs.”, which showcases a classic battle between Spider-Man and one of his many rogues gallery. For their fifth print in this killer series, Raid71 pits Marvel’s amazing web-head against one of his archenemies, Doctor Octopus! 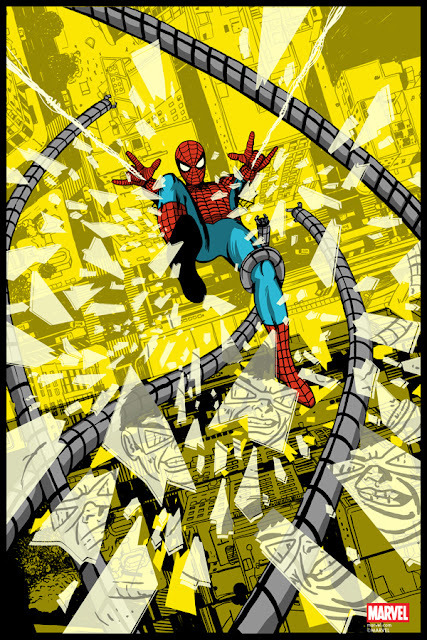 I love how Thornley was able to make it look as though Spider-Man had really just been thrown out a window. “Spider-Man vs Doctor Octopus” by Raid71 is a 24”x36” hand numbered Marvel screen print. The Regular Edition is limited to 125 pieces and will retail for $45, while the Foil Variant is limited to just 55 pieces and will retail for $60. Both versions will go on sale at 1pm EST this Wednesday, April 19th, at the Grey Matter Art online store.